Singapore -- BUDDHISTS hurt by Pastor Rony Tan's criticism of their faith are talking back with the help of a new guidebook out this month. 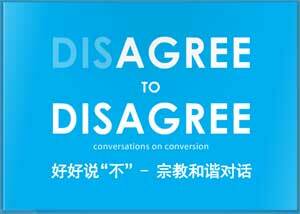 Titled Agree To Disagree: Conversations About Conversions, the 28-page booklet gives readers prepared responses for situations in which they are asked by others to convert to another religion. The project is sponsored by two of the largest Buddhist temples here - the Kong Meng San Phor Kark See Monastery, off Sin Ming Avenue, and the Kwan Im Thong Hood Cho Temple in Waterloo Street. The people behind the writing and research belong to Dharma in Action, a group of Buddhist professionals that includes teachers, social workers and counsellors. They say their aim is to 'support fellow Buddhists who are facing proselytising by others in their workplace, school or even at home'. Spokesman Lim Seow Yuin, 30, said the book was conceptualised last year and was not planned as a response to Pastor Tan's mocking comments about the religion made in his church in February. But she added that the incident was 'an example of the kind of situations Buddhists often find themselves in'. The Singapore Buddhist Federation (SBF) and Inter-Religious Organisation, Singapore (IRO) said they support the book's aim to promote peace between religions. This is the first attempt among Buddhist groups here to speak openly about proselytisation - a delicate subject in multi-religious societies. And with endorsement from the two Buddhist temples and SBF, it may be the closest to a unified stand taken by a faith group on how devotees, feeling pressured in such situations, should respond. Buddhists say they have felt proselytising efforts intensify in recent years, and while the book does not single out particular religions, its implicit reference to Christian groups is clear. In February, Pastor Tan interviewed in his church two ex-Buddhists who said they converted to Christianity because they found Buddhism unsatisfying. Pastor Tan's remarks on Buddhist precepts - such as rebirth, karma and nirvana - drew laughter from the crowd, and quickly led to public censure and an investigation by the Internal Security Department after the exchanges were videotaped and uploaded online. He apologised and recanted his statements fully. When the dust had cleared, the authors of the book felt they needed to deal with the specific issues he had raised, and included a section that clarified his comments. The new guidebook, which also has sections on Buddhist philosophy, gives examples of scenarios set in familiar environments - at work, in school, at home, and in public - where Buddhists may encounter proselytisers. Responses to the book by Buddhists were varied. Some said it was useful, while others said it was defensive or not worded strongly enough. Christian, Muslim, Hindu and Taoist groups said they do not have specific rules on how followers should respond to proselytisers, mainly because a person's rights to practise, switch or promote his faith are freedoms protected by the Constitution. But they agreed that the book's message makes common sense, and share the Buddhists' stand that when facing unwelcome advances, what works is this: Smile, end the conversation politely, and walk away. A total of 5,000 free copies of the book will be available at the Kong Meng San Phor Kark See Monastery on Vesak Day on May 28.